The success of your children’s education can be found in many successes of the school day. This includes their lunch time. In order for the lunch program at Saint Benedict Catholic School to succeed, we need TWO dedicated and faithful volunteers EACH DAY to help in the cafeteria. Volunteering in the cafeteria is a unique opportunity for you to help out, meet other SBCS parents, and see your child during non-instructional time at school. 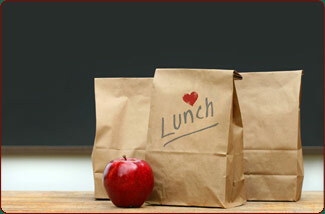 The cafeteria lunch hour begins at 11:15 am and ends at 1:00 pm. Volunteer duties include opening and closing down the kitchen, delivering the correct order to students, set up the serving line with napkins, utensils, etc., help students who have no lunch, monitor that students are cleaning tables and dining area, and wiping down kitchen counters, sink and wash any used utensils. You can sign up for once a week or twice a month or whatever is convenient for you. If you have volunteered before, we gladly welcome you back and if this is your first time, we welcome you and thank you for your time. We look forward to seeing you in the cafeteria and the children will enjoy seeing a familiar face from home!